I have what I think is a fun crochet idea. It involves circles and it would be for the kids. This yarn is from Miss Babs and is aptly named Perfectly Reckless. Each skein seems to have different colors than the other. They really make me smile! Look what Dover and Madden has done with Noro. Noro never looked so good, especially in crochet! I think I might just give the Perfectly Rreckless from Miss Babs a try. If Junior starts kvetching about the pink bits in it I'll simply show him the Deep Sea Jellyfish colorway above, and let him thank his lucky stars I didn't choose it. I'll update you if this design goes any further! Right now, it's just an itch somewhere in brain, keeping me up and on Ravelry much too late! These days, every minute is filled with fantastic knitting adventures. I have some lovely things coming out in a bit and I'm very excited about it! Here's a teaser although truthfully, the skeins on top are for crochet experimentation. Catania cotton. Enjoy your weekend! A bit of pink color gradation, just for some weekend inspiration (spring - can you feel it?) The snowdrops are out here at Casapinka and I received a fistful from each kiddo the other day. Love that! Eric Carle has the best rabbit illustration. Straight and to the point, I want this on my wall! This is what my road looks like now - with a bluish twilighty twinge. Everyone I know is tired of snow. The lighthouse down the road is tired of snow. Even the snow is tired of the snow. Overworked, underappreciated with out-of-touch middle management. I can imagine a few flakes up in the clouds, lounging by a warm fire sipping bourbons, when they get the signal to go. They heave heavy sighs as they put down drinks, take off their slippers and roll to the edge the cloud. "See you guys at evaporation!" they shout as they drop off their cloud, grateful they have a job with the economy the way it is. (Photo of a historic home's gate down the road from us.) Guess this would make a fun kids book topic.."Snowflakes feel the USA works them too hard and they deserve a full 4 weeks off like the Europeans get." I just discovered this absolutely adorable Etsy store called Apple White and ordered these tooth fairy cushions for the kiddos. They are really growing fast so I have limited time for this sort of thing. See how the door opens and the tooth is placed inside? Dana, the owner, is going to switch this button for a bright red one for Junior. Incidentally, I was greeted at school yesterday by a huge smile from Bubbles: "Notice anything?!" she grinned wide at me as I struggled to figure out what was different. Her brother had all of his hair and fingers. I didn't see any tatoos. Ah! Turns outh er first molar was gone, although she'd had no loose teeth that morning. I can only imagine how much wrenching went into getting that tooth out so the tooth fairy would visit. Good thing these will be on their way soon. Apple White's shop, I think you'll agree is so charming you'll want something for yourself, even if the tooth fairy no longer visits you! I got out a bunch of random yarn last night because I got it in my mind that I should knit some letters to casually toss on beds and couches. The reality was, I was just about done with this giant striped cushion cover and didn't feel like sewing fabric to the back. It's 24X24 and has the Irish flag hidden in the middle of pinks and yellow. You can see I borrowed some yarn from this which is getting pretty long. Crochet is kind of hard for Americans, in that non-shiny cotton in a great array of colors has eluded me...I end up ordering from the UK which bums me out since I like to buy locally. I feel like I've been working on this sweater design forever! First it was too big. I let it sit for a couple of months and then frogged it. I'm reknitting it, because maybe by the time it is finished our winter will be over and the cherry blossoms will be out! I'm actually making it as a pullover but then will steek it to make it a cardigan and have a pattern written for both. Have a good great awesome weekend, all. Right now I feel like it's time to snap up the bathroom a bit. I don't want an all pink bathroom but a touch would be nice. We have a few odd angles which would lend themselves to some splashes of color so right now I'm on a kick to get this done before spring (which, let's face it, seems unlikley to ever arrive!) Love this wallpaper but have no idea the brand, via Modesthomeplan. I feel like coral is going to make a big comeback over the next couple of years. It's not that trendy now but I'm craving it in small bits, via Southerbelle's Flickr site. My RISD teacher wore this gorgeous coral lipstick the other day and I wanted to grab it right off of her! Pearlescent pink tiles would be great but def woulnd't make it past the front door (Hello, human barricade, aka Husband.) via . Votelindaelis. This is probably too much pink for me to put in our master bath but I do admire it! Via Braxton and Yancey. 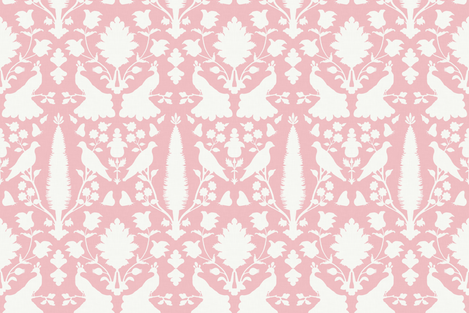 I guess this is a pretty good excuse to spend the next 18 hours on Spoonflower to find the perfect bathroom wallpaper! As is this. I'd better stop now! 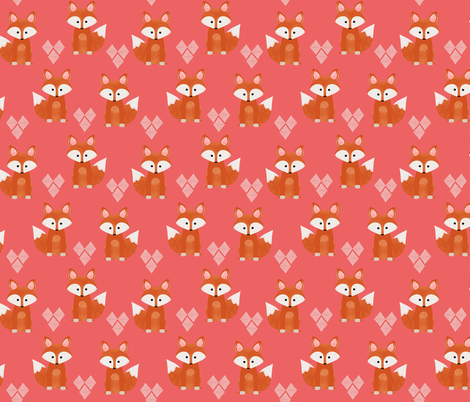 Love Spoonflower, don't you?